SkyNET is a sequel to 1995’s Terminator: Future Shock – a game which suffered from poor execution, but which basically had its heart in the right place. The engine was astounding for its time, and the environments were the best representation of the films’ nuclear future yet seen. Its mission-based architecture, and rather legitimate attempt to tie plot and gameplay together, also earned high marks from, well, me at least. If nothing else, it definitely deserved another chance. Bethesda takes that chance with SkyNET; the last and best of their games based on the franchise. Things wrapped themselves up pretty tidily in Future Shock, so I can only assume that SkyNET is meant to be a prequel. This allows characters to return and some limits to be put on the technology – much of FS was about the development of new machines that rolled out as the game progressed, so you won’t see their most advanced work (T-800s and time displacement) in this game at all. Instead, it’s a fairly straightforward story without an epic confrontation or any sense that this is the final battle to end the war. On a routine patrol, you personally discover a functioning nuclear missile recovered by the machines. You have until noon the next day to gather as much intel about the weapon as possible and stop the bots from launching it to destroy Los Angeles… err… again. The levels do a better job of being interesting. All of the atmosphere I lauded in my review of Future Shock returns here, and the blasted cityscape looks just as lonely as it did in the first. 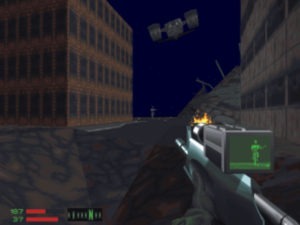 Though the game still has its fair share of standard FPS dungeon levels (present here as military complex levels), most of the action takes place in the shattered streets of L.A. It’s still impressive to see a mammoth spiderbot trample after you through overturned cars and twisted light poles. I did notice that the walking levels seem somewhat smaller and less detailed than those in the first game, in the sense that you’ll start maybe a block away from your main objective this time, rather than four or five in the last. However, even levels with a non-city focus – like the machine factories – will still have a block or two of city on the outskirts. These give you the chance to find and collect supplies. You can also still enter buildings and find a few health packs or clips of ammo. There are a few more neat touches like “dawn” levels that replace the starry night sky with a blazing red sunrise background. These even come in an appropriate sequence, so night transitions to morning across the length of the game, while the plot references the time you’re running out of. 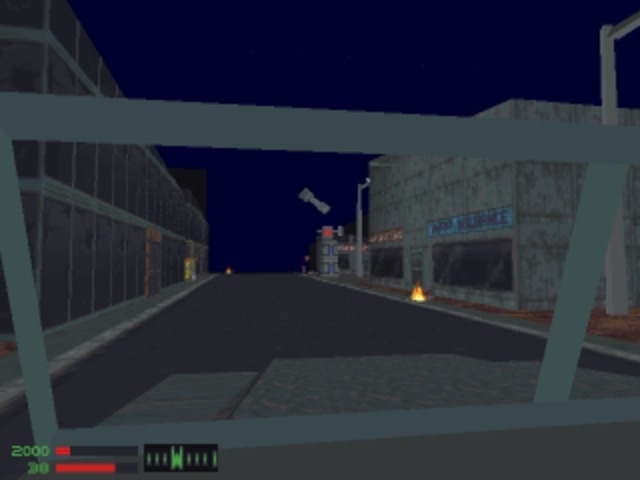 The outdoor areas, from jagged polygonal terrain to city blocks and ruined freeways, and all are done as well as they were in the previous game. The frequent sewer mazes are also thankfully toned down to just a section of one level in this game. The laser rifle’s scope works out-of-the-box in the sequel. SkyNET does appear to have been influenced by the titles coming out between the two games, most notably by Duke Nukem 3D and Jedi Knight. Interactive objects make appearances in the levels, where they never did in the original. 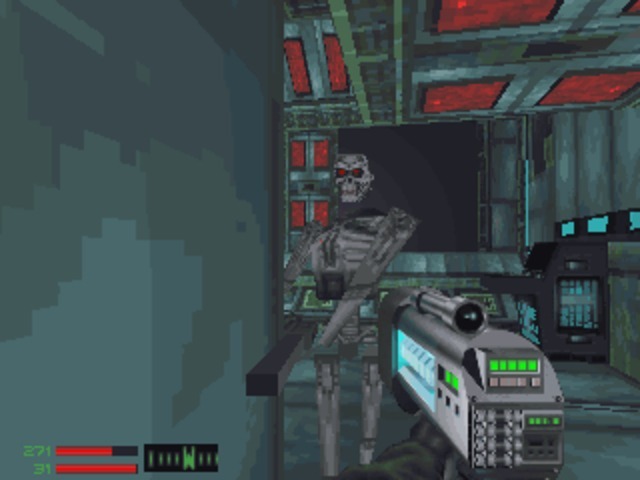 You’ll encounter a completely working elevator (an actual moving box inside the level instead of the usual faux level transition), use an I-beam on a conveyor belt to smash open a section of wall to proceed, and activate various terminals in the basement of Cyberdyne to read messages and continue the plot. Also as in Duke, effort has been made to make the levels feel detailed and come alive – literally. One level puts you inside a submarine which starts sinking, and you must struggle through the rising water and claw your way back out. The influence of Jedi Knight comes in the rather blatant inclusion of 3-D level puzzles requiring clever reappropriation of a moveable environment. There’s a sewer system where you must flip switches to connect the right tunnels to proceed, and a fan/exhaust system in another level that’s much the same. The entire final level involves enough switch flipping, platform moving, and connector connecting that it’s almost worthy of Jedi Knight itself, and requires just as much frustrating trial-and-error. Unfortunately, the whole game is about seven levels long. This was originally intended as an expansion pack, and the length is about appropriate for one. As a standalone release, it feels short. Luckily, most levels are broken into multiple parts involving trekking up to a base, fighting through it, and then getting back out. Each section is really a “level” in itself, so it might be more appropriate to say that there are seven missions. It’s still something you’re going to blow through in a weekend without a great deal of effort. The driving and flying levels return, and continue to be some of the most enjoyable of the pack. There’s some noticeable draw-in on the flying levels and a heavy amount of enemies in any level, probably to offset the recharging weapons your vehicles carry. This does mean that it’s often safer to creep ahead and shoot enemies from safety, rather than rip through the scene in fifth gear. But if you know where you’re going, you can get there quickly enough to avoid many fights and you won’t be disrupted by any time-phasing magically-appearing rocket turrets. The freeways and overpasses retain the same level of detail and “realism” as the walking levels, meaning they didn’t skimp just because you’re blazing by at 70 MPH. You’ll even pass by the diner Sarah Connor was a waitress for in the first film. Despite having fewer levels total, driving and flying levels do return. The look and textures are mostly identical to those in Future Shock, with just about everything from that game reused here once, but a fair amount of excellent new textures for SkyNET-specific locales. The plot does try to move you around to areas more varied and exciting than another “machine research complex,” and it shows in the level design and decorating. The submarine, as said before, looks great. The basement of Cyberdyne, where SkyNET was allegedly created, looks particularly sharp as well. Some areas in the final level are particularly mammoth and impressive, as you run around the scaffolds of a high-tech launch site. SkyNET also brings with it a particular surprise – an updated version of the Xngine allowing for a 640×480 resolution. The results are quite impressive. Everything gains an obvious sharpness and clarity lost at 320×200, but to see the difference yourself is striking. The textures seem to have been created at a high resolution and do not turn blurry or stretched at 640×480. You won’t get any new effects or anything other than enhanced sharpness and detail, but what you do get is impressive enough to make it the desired way to play the game. SkyNET will also thoughtfully detect and update Future Shock, if you have it installed at the time, to allow you to play that game in 640×480 as well. Probably not worth a specific purchase of one for the other, but something to remember if you get a bundle deal or intend to play both anyway. Nothing has been improved in the sound department, but nothing really needed to be. All guns sound appropriate, powerful, and distinct enough to know what is being fired at you. Only a handful of whirrs and servo noises are used across all the foes, but these still sound appropriate and clue you into the basic size of the approaching death bot. You’ll also hear them far out from their actual arrival and cleanly through walls, which actually works for some nervous, spinning around “where are you?” moments as a Terminator slinks out from the alley behind you. The mouse-look and keyboard combination was a little more familiar to gamers by this time, and the ability to reassign the keys as needed is most welcome. The engine supports quick and smooth panning of the player’s view, so running under an overpass, watching a machine flier zip by overhead, then whipping around and blasting a walker coming through the door is appropriately quick and accurate. Enemies continue to be true 3-D, with no update to their look or textures. This was more impressive for Future Shock when it beat Quake to release, but for 1998, these characters look squarely average. Angular, triangle polygons are used for most of the characters, with the steel skeletons of the Terminators suffering from this the most. Especially with the higher resolution, they look close enough to Stan Winston’s legendary design to be recognizable, but a little too lanky to be really menacing. They still blow up into individual polygon limbs quite nicely though. Animations are a high point, and 640×480 assists in allowing you to see these creatures move with fewer shifting/blurring pixels, and a more defined shape at a distance. They’re not quite breathtaking, but machines like the spiderbot’s clanking individual legs, and the two-legged walker display a level of smooth movement that’s almost totally missed in Future Shock. Their AI can still be awfully simplistic, and they lose a bit of their danger as they get caught on doorframes or building edges and must sort themselves out. Still, they manage to surprise you now and again, which almost makes their disarming clumsiness worth it. The Terminators themselves even manage a few awesome moments – I had one chasing me around the corners of an office hallway. It took each corner without breaking a clean stride, efficiently raising its gun and firing off a burst each time it came around. It reminded me of Arnold stomping though the police station in the first film, with the same level of natural, precise movement. It’s moments like these that really bring a smile to a fan of the film, and it’s unfortunate that they are clearly possible, but seem mostly the result of happenstance. Finally, there’s a multiplayer mode, if you choose to pursue it. It’s a vanilla deathmatch in some pretty well-designed arenas based off of the single player game. The vehicles make it into most, and features like the ability to play levels at either dawn or dusk are neat. The highlight is, of course, playing as a Terminator. You lose a bit on the movement speed, but gain the classic red-tinted vision that highlights your opponents. Humans can counteract this to a point with a motion tracker always selectable on the “1” key, but in the frenetic nature of deathmatch, most of these hide-and-seek elements get dropped anyway. Despite its somewhat unique offerings, this feature was mostly overlooked at its release. You could play up to eight players over a LAN with one CD, but only two over modem. Two players, even as Human vs Terminator, is still going to be a boring game. Some third party programs like Kali probably could get around this limitation, but that required a level of Internet savvy that most gamers hadn’t adopted yet. Trying to play it now will require specific intent and a buddy, because you’re not likely to run across a match of this tucked away in some server lobby. SkyNET’s greatest asset is dropping the damnable time traveling enemies. This leaves only the good aspects of the first game, and a matchup of humans versus bots just like what was showcased in the films. Unfortunately, it seems like too little, too late. Seven missions feels short for a standalone product, and the storyline (and embarrassing acting) fails in comparison to Future Shock. 1998 was also too late to wow anyone with the graphics here, and the multiplayer component was almost totally overlooked. They had three years, which tells me most of it went to satisfying the gaming community’s demand that all games must have multiplayer no matter what. Even if top-level matchmaking and server tracking tools were available, clomping around deathmatch as a Terminator is a gimmick, at best. If Bethesda had thrown out the multiplayer component and given a storyline and length comparable to Future Shock (or Future Shock minus the phantom bots), then that would have been enough to satisfy me – the slobbering Terminator fan representative of their target audience. Varied, detailed locales. Updated 640×480 resolution polishes the engine. Best Terminator game Bethesda produced, and best at replicating the world of the films. Short single player game, and an apparent focus on an underused multiplayer game. Engine still has a few quirks and hiccups (like killing you on inclines).